shouts the crowd (mainly women lead voices and the men answer). Around 1000 miners and their family have occupied the Plaza de Armas (the Square of Arms) of the jungle city Puerto Maldonado, Peru, today, the 4th of April, at noon. 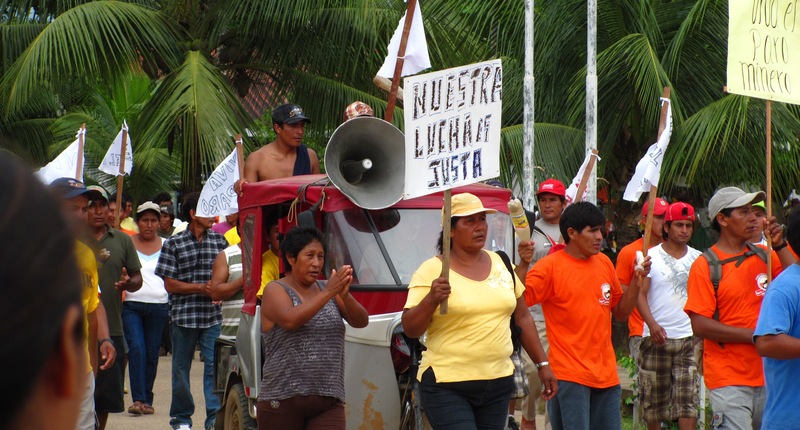 The miners taking to the streets of Puerto Maldonado is the first of, possibly, many days protest, in reaction to the new law by the minister of Environment, Antonio Brack whom On January 31, 2010, passed a law that forbids mining in several parts within the State of the Madre de Dios. The law would force the mining into designated areas. Miners would have to form co-operative (become formal miners) and the ways they are mining would be controlled. They would have to perform certain tasks in order to restore the environment they have destroyed (“replant trees after they finish mining” I was told by a local writer, whose brother is a miner), and of course… they would have to pay taxes. No more unofficial mining. No more small independent activities everywhere. The result such changes of would be that whole villages, placed on the “wrong” part of the map would be left without a source of an income. The new law, BTW, would do little damage, if not Much Good, to the major mining companies. 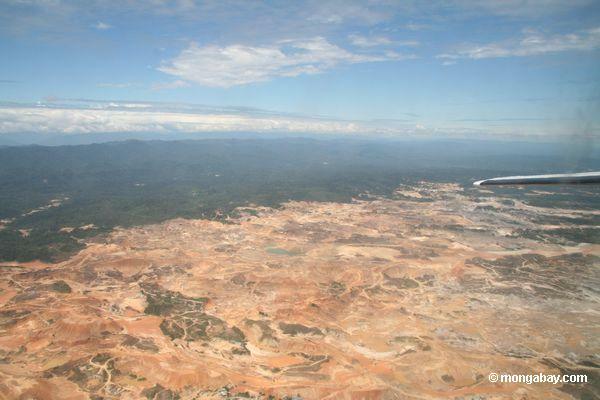 According to the local newspaper Mi Fontera, Whose reporter´s voice and the voice of the minister are mixing in a confusing harmony, 18,000 hectares of jungle have been cut down for the sake of informal mining (gold) and 400,000 hectares of Jungle are contaminated with Mercury. The Newspaper is quoting the minister (starting with a ´start quote´ mark but without a ´quote end´ mark),”The region of Madre de Dios is The region in the world with the highest bio diversity, something that the informal miners do not understand or just do not wish to understand. Miners and non miners in the streets are saying that offices would start getting burnt after a few days, if the government would refuse talks. 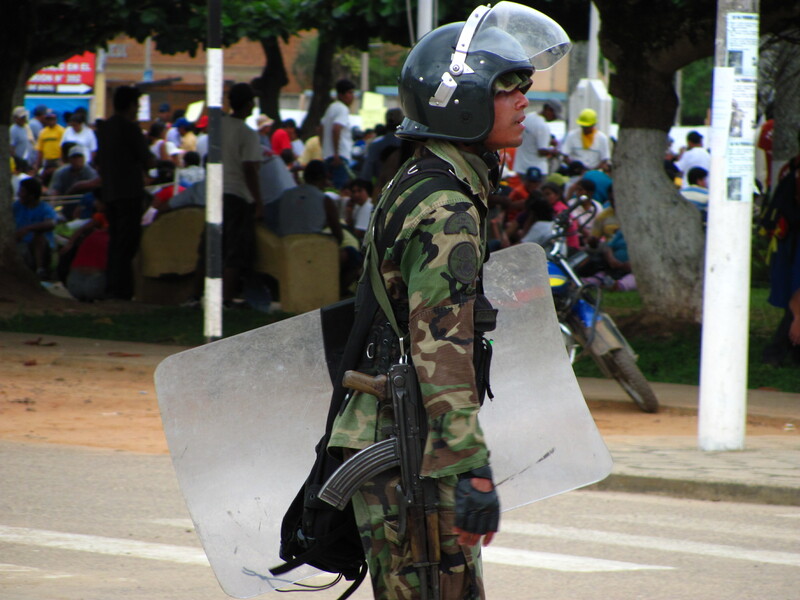 Possible targets might be the main governmental office, the mining department, and the ´very little liked´ NGOs (“90% of the money they get for projects in going to their salaries”). The plan of the miners is to strike indefinitely until the government repeals the law, and the government has already said they will not drop the law. Once a couple weeks go by and no food is able to reach Puerto, inflation will take over and people will have to pay exorbitant prices just to eat and drink clean water. And you drink it all in your ayahuasca, or is it aluminum from the pot the shaman uses?